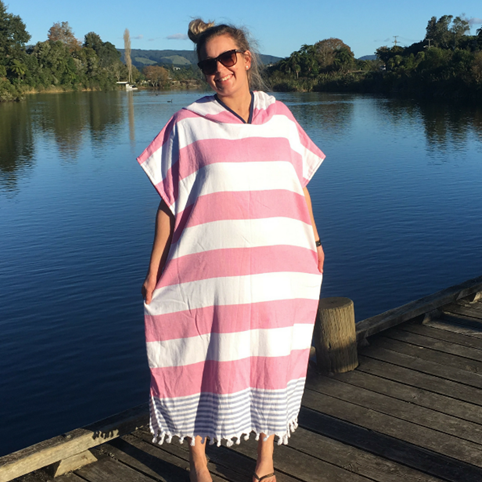 From towelies that let you get changed anytime, anywhere to kiwi burial pods with cultural designs printed on them, the line-up for the Rotorua X Pitch Night on 31 October is impressive. Eight aspiring businesses will pitch in front of a live audience and a panel of judges to win a share of more than $11,000 of business support services. Rotorua X trustee and event director Rachael McGarvie said the event is always a great night for the business community. Teams are supported in developing their pitch. They must attend a 90-minute pitching workshop by Firestation, the central North Island business growth centre. In addition, all teams have a one-on-one pitch coaching session to finesse their pitch. “Attendance is free, and we make sure everyone is fed and watered with nibbles, pizza and drinks throughout the evening,” McGarvie said. Debs Brockelsby launched her business StokedNZ last December and says she is excited, as well as nervous, to pitch. “While public speaking is really not a strong talent of mine, the brand exposure through pitching makes it well worth it”. “My products come from the enjoying outdoor adventures, and the challenge of getting changed after your bike, hike or swim. The awkward towel holds, the public toilet floor avoidance manoeuvres,” she says laughing. “It’s a towel and portable changing room all in one. It lets you get changed, wherever and whenever. We spent a lot of time working with fabrics before deciding on a quick drying, super absorbent, compact fabric”. “We launched in December last year and have just been blown away with demand and interest. We started with one size in four colours and have grown to seven sizes and over fifty colours”. Other pitch contestants include Tammy-Lee Homes and Cara Farrelly from Little Love Foundation, Bruce Drafting from Kiwi Pods, Danielle Campbell from SponsorhubNZ, Steve Holmes from Contribute, Te Rangikaheke Kiripatea from Kai Rotorua, Laurens Goormachtigh from Chess Minds and Heather Kremen from Amokura Glass. Each team will have six minutes to impress the judges to showcase their business or social enterprise. Pitch Night is on Wednesday 31 October from 5.30pm at Toi Ohomai Institute of Technology. The business community is encouraged to come along and help pick the crowd favourite. StokedNZ – Functional towels (aka Towelies) that enable you to get changed anywhere, wherever and whenever without flashing anyone. Little Love Foundation – helping families with the financial side of grieving for a young child. Kiwi Pod – burial pods made from recycled materials with a range of graphic designs applied to the outside for aesthetic and cultural appeal. Chess Minds – getting children and adults to enjoy chess and experience the benefits of improved decision making and strategic choices that it can bring to other areas in the players’ life. Kai Rotorua – help people reconnect with healthy food by growing and selling kumara and riwai with bigger plans to develop a food hub. Amokura Glass – Rotorua’s only glass blowing studio. SponsorHubNZ – a match-making service for small business and non-profits to facilitate sponsorship arrangements.